The icy south pole of Mars takes center stage in this amazing close up from a larger photo of the Martian south pole and cratered Hellas Basin region captured by the European Space Agency's Mars Express orbiter. While the image was released last month, Mars Express captured it on Feb. 25, during summer in Mars' southern hemisphere. The ice cap was relatively small at the time; during winter, the cap grows to fill the smooth region that can be seen surrounding it in the photo, ESA officials said. This sweeping view by ESA’s Mars Express extends from the planet’s south polar ice cap and across its cratered highlands to the Hellas Basin (top left) and beyond. 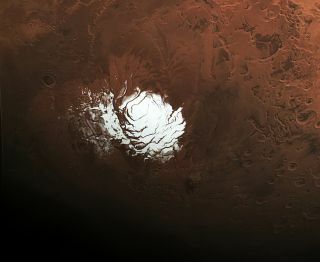 The crater-scarred area above the ice cap is the Red Planet's ancient southern highlands, and part of the giant Hellas basin can be seen at the top left of the image. The Hellas basin spans more than 1,367 miles (2,200 kilometers) and is about 5 miles (8 km) deep. Scientists think a powerful asteroid impact gouged out this basin shortly after Mars formed. Two thin, wiggly lines on the outer edges of the basin correspond to two deep valleys — Dao Vallis and Niger Vallis — that may have been carved into the planet's surface by water. The image was something of a happy accident. A photo showing a region of Mars this wide is unusual, ESA officials said, because Mars Express typically takes images pointing straight down toward the planet's surface at an altitude of about 186 miles (300 km). That's the closest to the planet that the spacecraft comes during its elliptical orbit. But in this photo, called a "broom calibration image," the spacecraft turned so that its camera looked over the surface while far above the planet, at around 6,151 miles (9,900 km) — the farthest it gets from Mars. "Importantly, as well as affording an unusually wide view, this allows the camera to record a range of features at the same illumination conditions, allowing essential calibration of the camera's sensors," ESA officials wrote in an image description. Editor's Note: This story was updated to reflect a correction. The Mars Express orbiter did not discover the polar ice caps on Mars, but confirmed that they contain water ice.